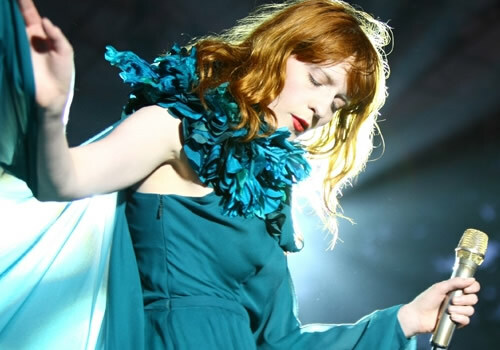 Released in the summer of 2009, Florence + the Machine’s debut album, “Lungs,” spent 27 weeks on the Billboard 200 chart, with tracks heard everywhere from “Glee” to “Twilight” to the “Eat Pray Love” trailer. The group received a Best New Artist Grammy nomination in 2010, and by the time the ceremony came around this February, Welch was part of the show opener, joining Jennifer Hudson and Christina Aguilera in a tribute to Aretha Franklin. She’s still only 24 and living with her family in South London, but like Adele and the late Amy Winehouse, Welch is an old soul forging a new soul sound — ghostly pale and six feet tall in flowing gowns, with a bluesy wail and the songwriting chops to elevate the dramas in her head into grand epics. On this summer’s North American tour, Welch traded her signature vintage looks for custom Gucci garments designed by the label’s creative director Frida Giannini: just one of the fashion folk who has claimed the ethereal singer as her muse.